Faure was hoping to land a few of the 3,600 rainbow trout released at the lake earlier in the month by the Missouri Department of Conservation (MDC). 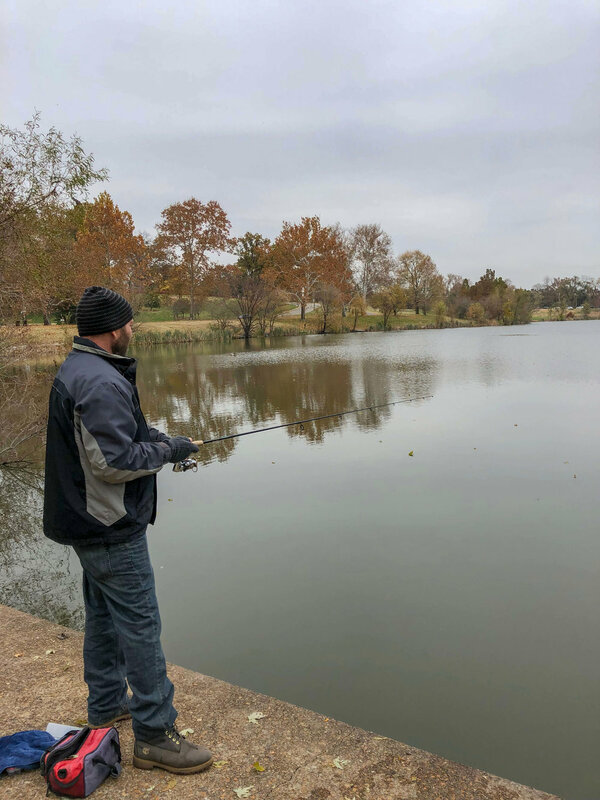 MDC — which will celebrate the 50th anniversary of its urban fishing program next year — stocks about 40,000 trout in 17 designated winter trout fishing area lakes in the St. Louis area annually. MDC Fisheries Management Biologist Kevin Meneau explained that Jefferson Lake the largest trout lake in St. Louis City and County, also features aerators to keep the water “open,” making it a good spot to release the popular fish. That combination of clean water and easy access draws hundreds of anglers like Fauer to Jefferson Lake every year for winter trout season. Between November 1 and January 31, trout can be caught on a catch-and-release basis only, which means that no trout permit is necessary — but you will need a fishing permit. After January 31, up to four fish per day may be harvested. Forest Park East resident Mark Minden discovered trout fishing in Forest Park while visiting with his kids — Sheamus, Alannah, and Adele — before the start of the school day several years ago. He bought a pole that day. Minden said he was amazed to find not just the trout, but a culture of regulars who fish in the Park regularly. “I’ve gotten to know everyone around the lake. It’s a magical area — it’s my chill spot,” Minden said. Over Thanksgiving, Minden again enjoyed the family trout tournament that has become a holiday tradition. He even made a trophy that rotates to the winner every year. “But it only has one name on it: Minden!” he said. Across the lake, Ray Trout (no kidding!) and Adam Gabor watched their lines from the shore. Gabor agreed that Jefferson Lake’s location is a big edge over larger lakes, like Lake Taneycomo, which is an hour and a half away. “We both have to go in to work this afternoon, so this way we can go fishing and enjoy a little nature before we head in to the office,” Gabor said. As the men tended to their lines, a bald eagle lifted off from its tree branch and soared over the lake. They watched wordlessly as the majestic bird dipped down and skimmed the water, looking unsuccessfully for a trout of its own, before gliding overhead and landing in another tree. “That makes a successful morning right there,” Trout said.